Almost 40 years after Schopf (1968) originally reported presumed green algae from the Bitter Springs Formation in the Amadeus Basin (Australia), it is difficult to appreciate the controversy this discovery caused at the time. Originally thought to be ~ 1-0.9 Ga in age, the Bitter Springs is now considered to be 830-800Ma and is discussed in more detail later (see Neoproterozoic). The deposit includes fossilized microbial mats with microfossils preserved in chert. 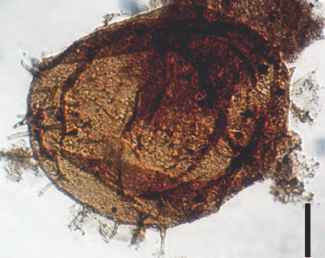 The microfossils Caryosphaeroides and Glenobotrydion are spherical cells with opaque material inside the cell walls (Schopf, 1968; Schopf and Oehler, 1976), and it was suggested that these microfossils could be assigned to the Chlorophyta (green algae; Chapter 4). Cells of C. prístina average 13 pm in diameter and those of Glenobotrydion, 9 pm; by comparison, the filamentous and spherical bacterial cells in this same deposit are generally <10pm in diameter. Both of these organisms contained opaque material, which was interpreted as the remains of nuclei in Caryosphaeroides and the remains of a pyrenoid-like body in Glenobotrydion (Oehler, 1977). Knoll and Barghoorn (1975), however, examined stale cultures of living cyanobac-teria (Chroococcus) and concluded that all of the fossil intracellular objects could be explained as artifacts resulting from the coagulation of cytoplasm in a prokaryotic cell. Despite the fact that interpretation of these structures remains controversial, there is no doubt that the presence of intracellular material in Precambrian cells, whether cytoplasm or nuclei, represents a remarkable case of fossil preservation. Eotetrahedrion is another important (and controversial) fossil from the Bitter Springs biota; it consists of a tetra-hedral tetrad of spherical cells surrounded by a sheath-like structure (FIG. 2.26) (Schopf and Blacic, 1971). Cells average 9.4 pm in diameter and many include a triradiate mark on the surface. What is especially interesting is that this type of mark is commonly seen on spores of land plants after meiosis has occurred (e.g., see Chapters 5, 6). Such spores are produced during sexual reproduction by the process of reduction division, in which a single cell (spore mother cell) with a diploid complement of chromosomes (referred to as 2n) divides to produce four identical products (spores), each with one half the chromosome complement of the mother cell (n). Many of these spores are produced in a tetrahe-dral tetrad (4 spores), and the triradiate or trilete mark on the spores denotes the contact face where each spore in the tetrad is in contact with the other three. The presence of a triradiate mark on spores is generally assumed to represent evidence of meiosis. Thus, it was initially suggested that the marks on Eotetrahedrion indicated the occurrence of meiosis and, therefore, of sexual reproduction during the Proterozoic. Some green algae and cyanobacteria, however, are known to produce mitotically derived tetrahedral tetrads of cells or spores, so this arrangement of cells cannot necessarily be considered definitive evidence of meiosis or sexual reproduction in the fossil record (see Chapter 6). Work completed since Schopf's (1968), and Schopf and Blacic's (1971) research on the Bitter Springs chert has demonstrated that eukaryotes had definitely evolved by 830-800 Ma; in fact, they were present far earlier. Cloud (1976) suggested that the earliest eukaryotic cells occur in the 1.3 Ga Beck Spring Dolomite of California, based on the occurrence of filamentous forms resembling siphonaceous green algae and unicells that range from 40 to 62 | m in diameter (Cloud et al., 1969). Similar to the cells described by Schopf from the Bitter Springs microbiota, nearly all of these forms include a dark body within the cell. Because of the diversity of forms present in this biota, Cloud (1983) suggested that the eukaryotes may have arisen anywhere from 2 to 1.3 Ga. Further support for this assumption is the report by Schopf (1977) of an increase in cell size of both filaments and unicells starting at ~ 1.4 Ga.
the surface of the cell wall (FIG. 2.27). Knoll et al. (2006b) proposed that to be definitively classified as eukaryotes, microfossils must (1) be large, (2) have a preservable wall, and (3) have processes (elaborations of the external wall). Prokaryotic cells, with a few notable exceptions, are generally < 10 pm in diameter, whereas eukaryotic cells can range from 10 pm to hundreds of microns in diameter. with evidence of the biomarker, dinosterane, in the same rocks as the fossils in the Mesoproterozoic Beidajian Formation (see also Chapter 4). Other evidence, however, suggests that eukaryotes may have arisen much earlier. Brocks et al. (1999) found ster-anes in the same Neoarchean rocks (~2.7-2.6Ga) from which they extracted cyanobacterial biomarkers as evidence of oxygenic photosynthesis. Steranes are only produced by eukaryotes, but Summons et al. (2006) have shown that previous reports of steranes in cyanobacteria can be attributed to eukaryote contamination of cultures. In addition, sterane biosynthesis requires oxygen, so this research suggests that both eukaryotes and oxygenic photosynthesis were present ~2.6 Ga (Brocks et al., 1999). To date, no generally accepted microfossil evidence has been found to corroborate these geochemical hypotheses. 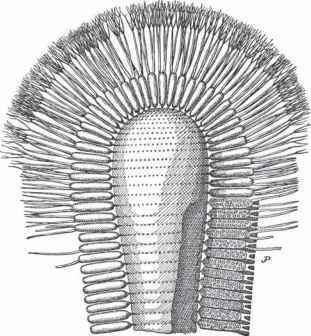 Several authors have suggested that the spiraled compression fossil, Grypania, may represent the earliest eukaryote. Han and Runnegar (1992) described ribbon-shaped, spi-raled carbonaceous films from the Negaunee Iron Formation (2.1 Ga) as Grypania, and noted that the thallus could reach 0.5 m in length, although it was only 0.5 mm in diameter. Samuelsson and Butterfield (2001) suggested that the Grypania specimens from the Negaunee Iron Formation are unlike those from younger rocks (which are clearly eukary-otic) and should not be considered the same organism. A number of similar carbonaceous films have been described from Proterozoic rocks, and many of these have been shown to be pseudofossils (Lamb et al., 2007). Possible evidence for the origin of eukaryotic organisms around 1 Ga comes from reports of similar megascopic fossils from various localities around the world (Walter et al., 1976; Hofmann, 1985b) , It has been suggested that some of these megascopic fossils represent eukaryotic algae. Chuaria is one of the most widespread genera of this type and has been described from the Little Dal Group in northwest Canada (1080-780 Ma) as black, circular compressions ranging in size from microscopic up to 4.6 mm in diameter (Hofmann and Aitken, 1979). Concentric wrinkles on the surface are present on many specimens. Chuaria occurs worldwide and was originally thought to be restricted to rocks 1.1-0.6 Ga, where it was used as an index fossil. In the Little Dal Group, Chuaria occurs with ribbonlike, often curved, sometimes tubular compressions several centimeters long that are given the name Tawuia. This biota also includes filamentous bacteria, cyanobacterial sheaths, and possible acritarchs. Chuaria was originally interpreted as a planktonic eukaryotic alga and Tawuia as a probable alga, although metazoan affinities could not be completely discounted for the latter. Better-preserved specimens of both taxa from northern China (Sun, 1987) suggest that at least some of these compressions may represent prokaryotic aggregations. These fossils were studied by means of cellulose acetate peels and bioplastic transfers of the rock surface, techniques which revealed that both taxa represent colonies of filamentous cyanobacteria; Sun compares them to the living genus Nostoc . This interpretation helps to explain the variable size and morphology of these unusual remains. Other authors, however, regard Chuaria and Tawuia as developmental stages of the same organism, which is thought to be some type of benthic, tubular macroalgae (Xiao and Dong, 2006). Similar fossils from Paleoproterozoic rocks were described as seaweed-like algae (W. Zhu and Chen, 1995; Yan and Liu, 1997), but these specimens are now considered to have uncertain affinities or represent aggregations of prokaryotes (Butterfield, 2000; Knoll et al., 2006b). Grazhdankin and Gerdes (2007) examined discoidal compressions made up of concentric rings. These had previously been identified as metazoans, but these authors compare them to ring structures in modern microbial mats and conclude that they are formed by either bacteria, fungi, or protists. The earliest fossil evidence for eukaryotic life occurs in the Paleoproterozoic in the form of acritarchs. Although there is geochemical evidence in the latest Archean, there is yet no widely accepted fossil evidence to support this finding. There is excellent evidence, however, that eukaryotes diversified into multicellular forms in the Mesoproterozoic. How can algae tappania be fossilized?